EMBD was pleased to be a Silver sponsor at the Commonwealth Association of Planners Americas Conference, hosted by the Trinidad and Tobago Society of Planners in collaboration with the Ministry of Planning, Housing and the Environment and the Commonwealth Association of Planners. The conference and workshop was entitled “ Partnerships among the State, Civil Society and the Private Sector in Planning and Development”. 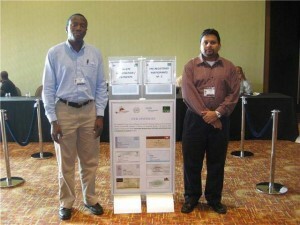 This event was held at the Hyatt Regency Hotel and Conference Centre on November 19 to November 21st, 2009. Presentations were made by different speakers on several topics including a. Coastal Zone Management b. The involvement of women in the management of urban space. Planning to aid in the stimulation of the economy. Three members of staff participated in at this very worthwhile and educational event. This entry was posted on Friday, November 27th, 2009 at 10:02 am and is filed under EMBD News. You can follow any responses to this entry through the RSS 2.0 feed. You can leave a response, or trackback from your own site.